July 19, 2017 "Information Clearing House" - The criminalization of political speech and activism against Israel has become one of the gravest threats to free speech in the west. In France, activists have been arrested and prosecuted for wearing t-shirts advocating a boycott of Israel. The U.K. has enacted a series of measures designed to outlaw such activism. In the U.S., governors compete with one another over who can implement the most extreme regulations to bar businesses from participating in any boycotts aimed even at Israeli settlements, which the world regards as illegal. 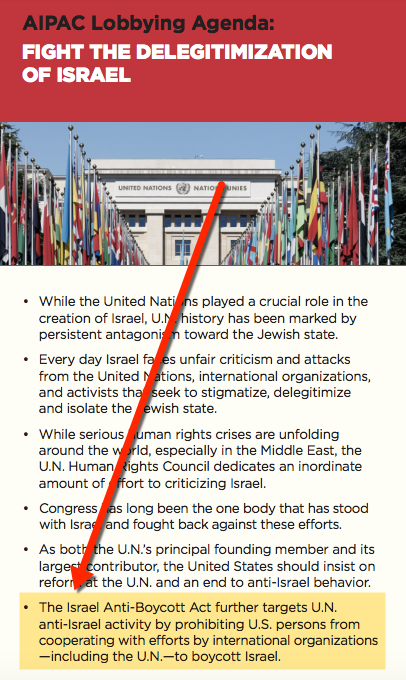 On U.S. campuses, punishment of pro-Palestinian students for expressing criticisms of Israel is so commonplace that the Center for Constitutional Rights refers to it as “the Palestine Exception” to free speech. But now, a group of 45 Senators – 30 Republicans and 15 Democrats – want to implement a law that would make it a felony for Americans to support the international boycott against Israel, which was launched in protest of that country’s decades-old occupation of Palestine. The two primary sponsors of the bill are Democrat Ben Cardin of Maryland and Rob Portman of Ohio. 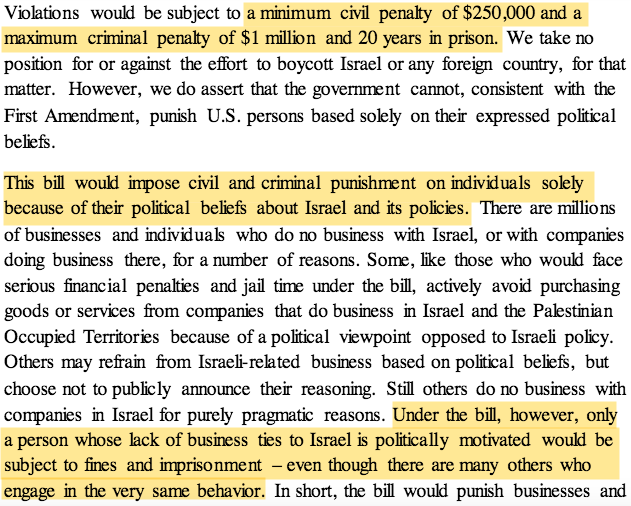 Perhaps the most shocking aspect is the punishment: anyone guilty of violating its prohibitions will face a minimum civil penalty of $250,000, and a maximum criminal penalty of $1 million and 20 years in prison. The bill’s co-sponsors include the senior Democrat in Washington, Minority Leader Chuck Schumer, his New York colleague Kirsten Gillibrand, and several of the Senate’s more liberal members, such as Ron Wyden of Oregon, Richard Blumenthal of Connecticut and Maria Cantwell of Washington. Illustrating the bipartisanship that AIPAC typically summons, it also includes several of the most right-wing Senators such as Ted Cruz of Texas, Ben Sasse of Nebraska, and Marco Rubio of Florida. A similar measure was introduced in the House on the same date by two Republicans and one Democrat. It already has amassed 234 co-sponsors: 63 Democrats and 174 Republicans. As in the Senate, AIPAC has assembled an impressive ideological diversity among supporters, predictably including many of the most right-wing House members – Jason Chaffetz, “Dutch” Ruppersberger, Liz Cheney, Peter King – along with the second-ranking Democrat in the House, Steny Hoyer. Among the co-sponsors of the bill are several of the politicians who have become political celebrities by positioning themselves as media leaders of the anti-Trump #Resistance, including three California House members who have become heroes to Democrats and staples of the cable news circuit: Ted Lieu, Adam Schiff and Eric Swalwell. These politicians, who have built a wide public following by posturing as opponents of authoritarianism, are sponsoring one of the most oppressive and authoritarian bills that has pended before Congress in quite some time. It is no small thing for the ACLU to insert itself into this controversy. One of the most traumatic events in the organization’s history was when it lost large numbers of donors and supporters in the late 1970s after they defended the free speech rights of neo-Nazis to march through Skokie, Illinois, a town with a large community of Holocaust survivors. The ACLU has similarly opposed bipartisan efforts at the state level to punish businesses who participate in the boycott, pointing out that “boycotts to achieve political goals are a form of expression that the Supreme Court has ruled are protected by the First Amendment’s protections of freedom of speech, assembly, and petition,” and that such bills “place unconstitutional conditions on the exercise of constitutional rights.” The bill now co-sponsored in the Congress by more than half of the House and close to half of the Senate is far more extreme than those. 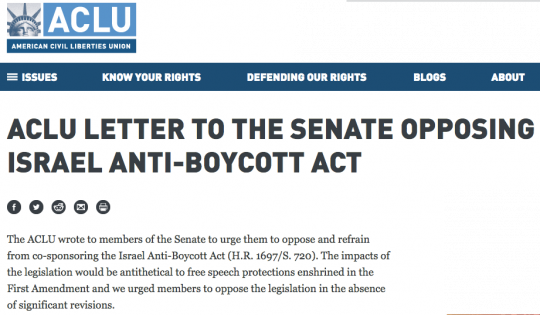 Congressman Lieu: Last night, the ACLU vehemently denounced a bill that you are cosponsoring – to criminalize support for a boycott of Israel – as a grave attack on free speech. Do you have any comment on the ACLU’s denunciation? You’ve been an outspoken champion for civil liberties; how can you reconcile that record with an effort to make it a felony for Americans to engage in activism that protests a foreign government’s actions? We’re writing about this today; any statement would be appreciated. This morning, Lieu responded: “Thank you for sharing the letter. The bill has been around since March and this is the first time I have seen this issue raised. We will look into it” (the Intercept will post any response from Rep. Lieu, or any late responses from others, as soon as they are received). Senator Cantwell told The Intercept she is “a strong supporter of free speech rights” and will be reviewing the bill for First Amendment concerns in light of the ACLU statement. This pernicious bill highlights many vital yet typically ignored dynamics in Washington. First, journalists love to lament the lack of bipartisanship in Washington, yet the very mention of the word “Israel” causes most members of both parties to quickly snap into line in a show of unanimity that would make the regime of North Korea blush with envy. Even when virtually the entire world condemns Israeli aggression, or declares settlements illegal, the U.S. Congress – across party and ideological lines – finds virtually complete harmony in uniting against the world consensus and in defense of the Israeli government. Second, the free speech debate in the U.S. is incredibly selective and warped. Pundits and political officials love to crusade as free speech champions – when doing so involves defending mainstream ideas or attacking marginalized, powerless groups such as minority college students. But when it comes to one of the most systemic, powerful, and dangerous assaults on free speech in the U.S. and the west generally – the growing attempt to literally criminalize speech and activism aimed at the Israeli Government’s occupation – these free speech warriors typically fall silent. 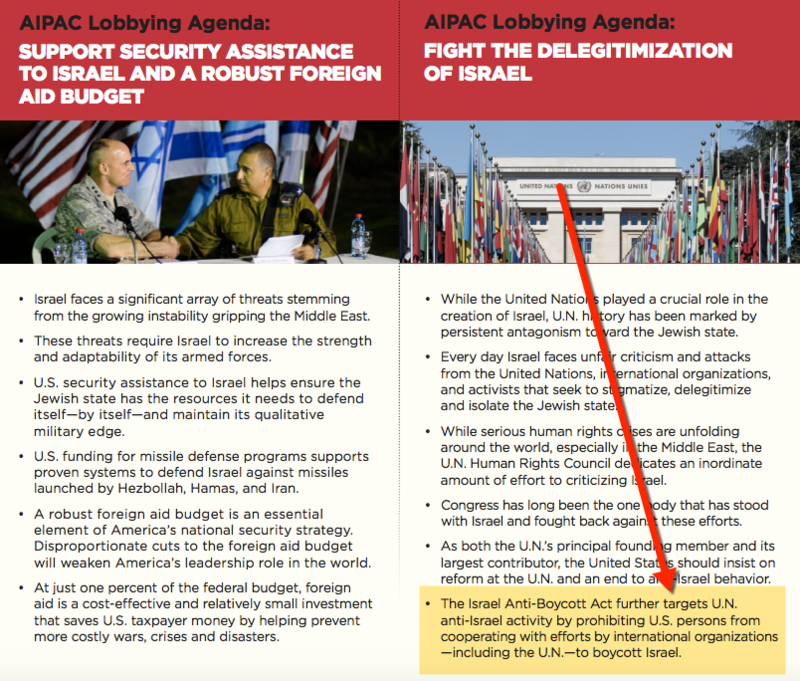 Third, AIPAC continues to be one of the most powerful, and pernicious, lobbying forces in the country. In what conceivable sense is it of benefit of Americans to turn them into felons for the crime of engaging in political activism in protest of a foreign nation’s government? And this is hardly the first time they have attempted to do this through their most devoted Congressional loyalists; Cardin, for instance, had previously succeeded in inserting into trade bills provisions that would disfavor anyone who supports a boycott of Israel. Finally, it is hard to put into words the irony of watching many of the most celebrated and beloved Congressional leaders of the anti-authoritarian Resistance – Gillibrand, Schiff, Swalwell and Lieu – sponsor one of the most oppressive and authoritarian bills to appear in Congress in many years. How can one credibly inveigh against “authoritarianism” while sponsoring a bill that dictates to American citizens what political views they are and are not allowed to espouse under threat of criminal prosecution? Whatever labels one might want to apply to the sponsors of this bill, “anti-authoritarianism” should be not be among them. Israel wants US to cut funding to Palestinians over armed resistance to occupation.